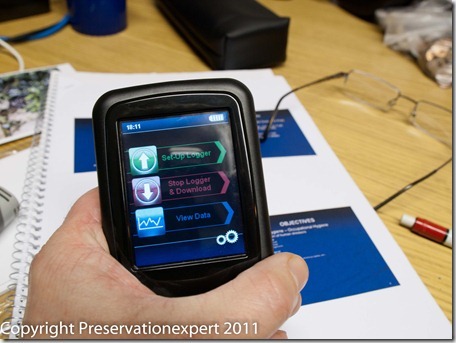 You are here: Home / Damp / Condensation / Lascar Data Pad review for damp diagnosis junkies. Condensation problems are growing, as are mould issues and complaints. Those of us involved in damp diagnosis sometimes use data logging equipment to measure humidity and temperature in and outside houses, to help build a picture of why condensation and mould is happening. I use Lascar data loggers and have just bought Lascar’s latest offering; The Data Pad, and I’m reviewing it here. Data loggers are just sensors with a memory chip inside and all they do is collect a set of measurements at fixed points for analysis later. Time lapse measurements are crucial in getting real information and avoiding the snapshot readings via a hand held hygrometer and thermometer; measurements on the day may be way off the average or miss important fluctuations. 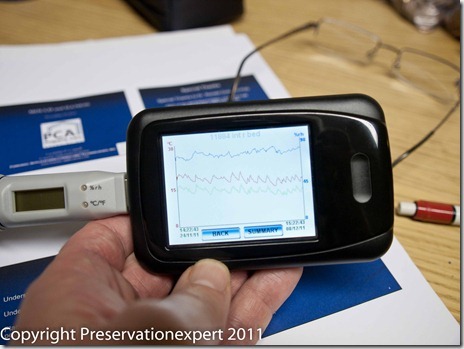 This approach is growing and was introduced to me by Graham Coleman of the Property Care Association, who has included instruction on their use and on psychrometrics for a number of years, as part of the PCA’s Damp Diagnosis and condensation course. That course is a well respected one and I’m sad to admit that I’ve sat through four times and I’ve seen it evolve over the years, getting better every time. Let’s face it, how many times has a damp surveyor arrived at a mouldy and apparently dry house? Only to be told by the frustrated owner “Well it was really wet yesterday, you should have come then”! Data logging solves this problem. Anyway, up to now, I’ve had to take my laptop to site, to set the loggers up and download the data. This takes time and means that I have to have my valuable laptop on hand. Why not set them up at the office Bryan? Well, until I survey the building I don’t know how many I’ll want to set up, where to site them or what to name them (if you look closely you can see the report number, followed by a location prompt on the screen 2 below –internal – back bedroom). I’ll need at least two, but sometimes more, if the house is larger and there are widespread problems with mould or damp. I only used two at the Harrogate survey. The Data Pad replaces the computer for setting up and downloading data. It’s about the size of my blackberry curve or maybe a little smaller. A simple case with a USB socket, small colour touch screen and a power switch. 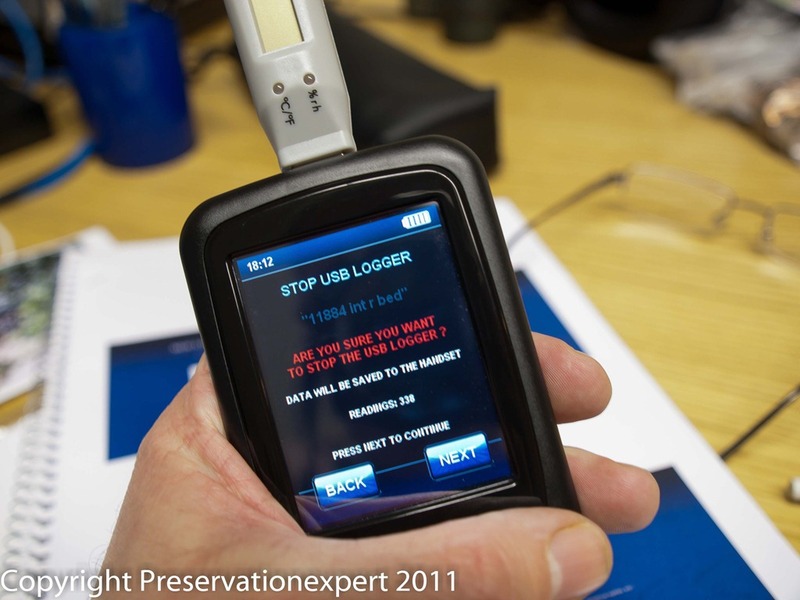 I surveyed a property in Harrogate a couple of weeks ago and set up two EL-USB-2LCD+ loggers there. I chose the locations after the survey, so I had to have my laptop to hand to do this, however, having received my Data Pad last Friday, I collected them today and left the laptop in the office. The data comes down in a moment and you can view it as a graph with your three plots and any alarm levels you set previously. Back at the office just plug the unit into the USB and it’s recognised as a new drive – just drag or copy the files to your folder of choice and open with Lascar’s EasyLog software. From there it’s a snip to export to a spread sheet and get the essential information you need to find out how the internal and external environments are acting. Well, it’s not essential, as the laptop will do. But if like me, your laptop is slow to boot up (damn that Vista) and if you don’t fancy lugging an extra case around on surveys, this is a snip at only £120 + VAT. It can hold up to 500 data files and I was able to get it working without even reading the quick start guide; it’s that easy. Top marks to Lascar for a simple and very neat tool. As always a very informative article, its great to be able to read a reveiw about a peice of survey equipment and understand it from some one in the industry and not have to rely on the manafacturers sales pitch. I have been thinking about buying some data loggers for a while now and I think the data pad will make things even easier to use. Fabulous …. will see what Dean thinks after he has been on the course in a couple of weeks. !! Thank you for the blog, great as ever! !